We already dined at Golden Cowrie Filipino Kitchen at The Podium last month. We’ve enjoyed the food and found the prices affordable, too, so hubby decided to have our son’s post-graduation celebration with the fambam here. It wasn’t only the three of us this time but also his grandparents, aunts and cousins. They were present, too, at our son’s grade school graduation ceremony earlier in the day to witness this milestone in our young man’s life. You’ll definitely want to come back again and again to this elegant-looking, brightly lit and spacious restaurant. 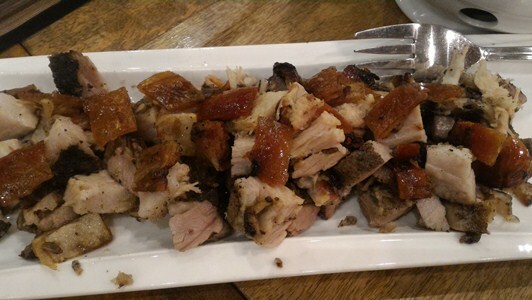 Don’t leave Golden Cowrie without trying this authentic Lechon Belly de Cebu. We ordered 1 kilo, had it chopped into smaller pieces and placed in two separate platters. This was the second time that our son had it, and he still enjoyed its flavorful, tender meat and crunchy skin. They serve this with vinegar. 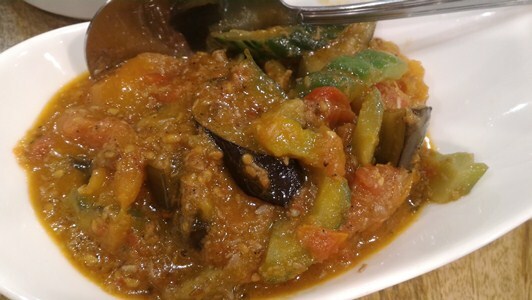 One of their best-sellers, this Cowrie Pinakbet is really delish! A tinge of sweetness perfectly balanced the natural saltiness of the shrimp paste mixed with fresh local veggies. We ordered the biggest Crispy Pata Golden Cowrie has because we’re a group of ten hungry people. 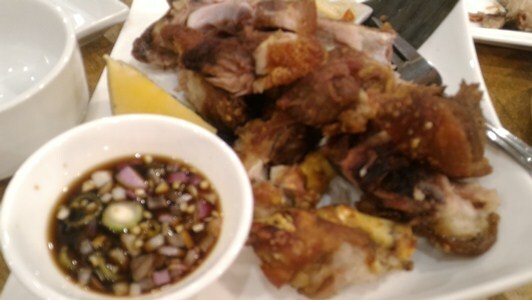 Both crispy (outside) and tender (inside), this all-time favorite Pinoy dish didn’t disappoint. Please pardon the blurry photo. 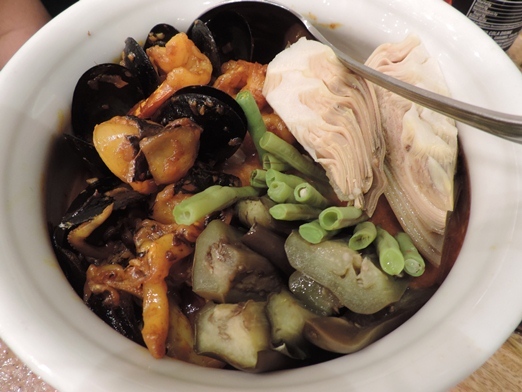 Justin’s lola and lolo (grandparents) enjoyed this Seafood Kare-Kare so much that they finished one serving bowl of this. Lol! It had mussels, squid and shrimp. 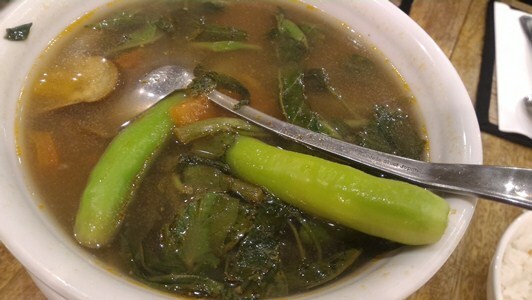 We needed something soupy and healthy to go with our Crispy Pata and Lechon Belly de Cebu, so we added Tangigue Sinigang to our lovely dinner. It was served just the way we like it, not too sour, and it had generous servings of tangigue chunks. Yummy! You bet we all went home satisfied from a hearty feast of delectable Filipino dishes! Congratulations again, Justin! The entire family is proud of you! 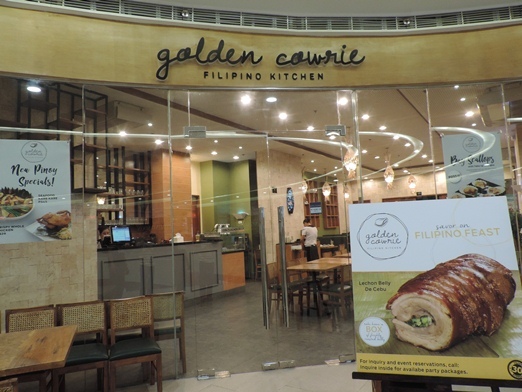 This entry was posted in Filipino Cuisine, Golden Cowrie Filipino Kitchen, The Podium. Bookmark the permalink. My family and I went here for lunch last December, and we all enjoyed the dishes we ordered, particularly the Singkamas & Pomelo Salad and the Bulalo. I was going to add great reviews via Google Maps, but was surprised that the Podium branch is still not tagged.